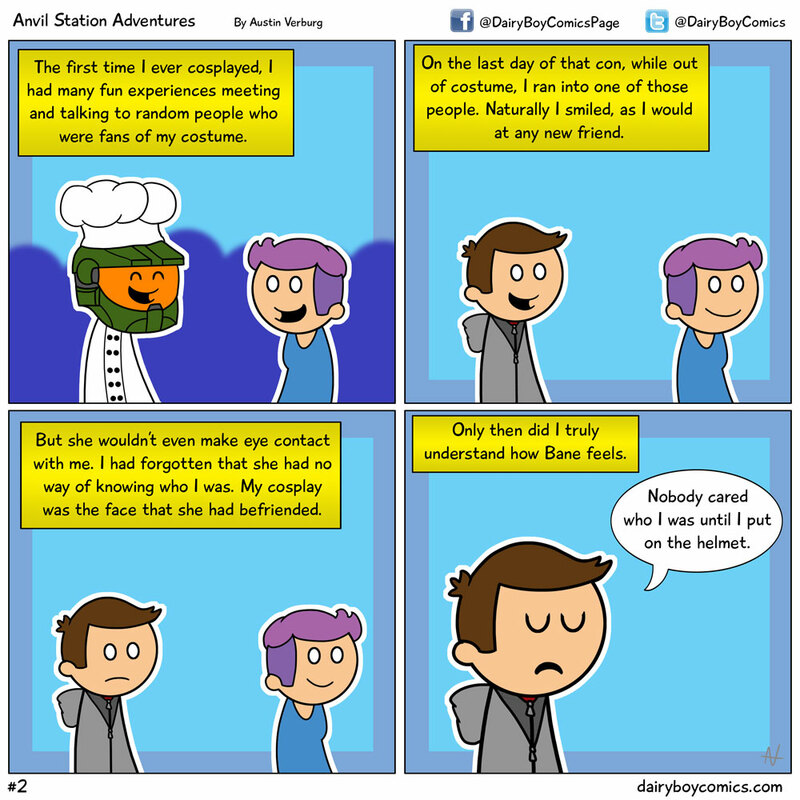 You Merely Adopted The Cosplay – DairyBoy Comics! So sure enough after committing to posting these blogs more often, it ended up being over a month before I got another one out. My bad… As I’ve slowed down comic production in order to accomplish many other big tasks involving the website and other things, I figured I could post a new entry rather than Austin’s Inferno today. So I had attended quite a few comic conventions before I tried out cosplaying, and it is a much different experience. When you’re at a con without cosplaying, you are there to enjoy the con. When walking around with a costume though, it kind of feels like you are a part of the con, like you’re an attraction. You’re what people came to see, and that’s not wrong. People surround you with their cameras and take pictures and hearing their laughter and awe is a one in a million feeling. During that first magical con in cosplay, I remember this girl working at a booth who wanted me to stop so she could take a picture. We talked for a bit, she was cool! I then continued on my way. After two full days of wearing my costume, I finished that last day at the con off just in my casual civilian clothes. I passed by that booth and made direct eye contact with that same friend. She immediately looked away and that was when I realized to her, I wasn’t the same person she had talked to the day before. It was then that I realized cosplay was a way to escape from myself and be someone else, if only for a couple of days. I’m actually working on a Reach style ODST costume right now. Any pointers?